This fully-furnished cabin is located on the tail waters of Bull Shoals Dam on the White River, famous for it's unparalleled trout fishing. The property sits between Wildcat Shoals and Rainbow Hole, both well-known as trout fishing hot spots. With shallow, walk-in access, it is a fly-fisherman's dream! IT CAN BE RENTED AS A TWO LEVEL 4 BED/4 BATH OR RENT ONLY HALF THE HOUSE EACH FLOOR WITH 2 BED/2 BATH BOTH WITH FULL KITCHENS LIVINGS, AND PRIVATE DECKS WITH SPECTACULAR VIEWS. 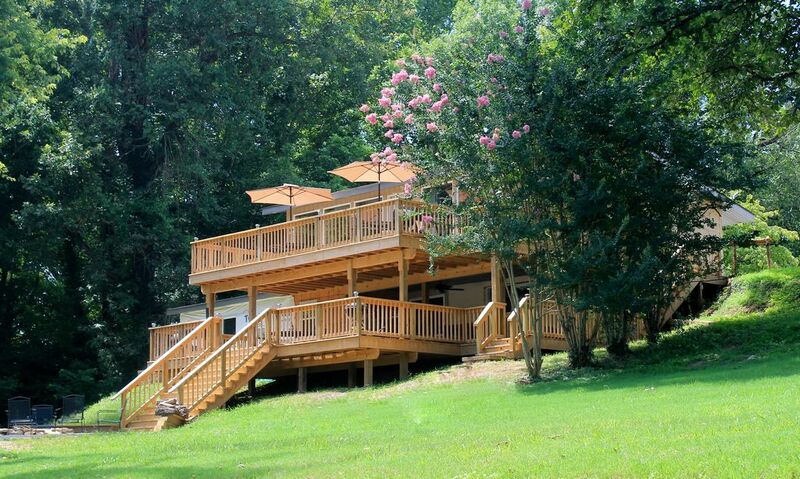 (WE DO NOT RENT BOTH FLOORS TO SEPARATE PARTIES AT THE SAME TIME) There is an active bald eagle's nest on the property, perfect for viewing from the large decks or riverside fire pit, and stunning views across the river of the wooded bluff. With 1 king, 3 queens, 1 full, 4 twins, and 3 queen pull-outs, you can bring the whole gang! A picture perfect walk-in access to the beautiful White River! Located between Wildcat Shoals and Rainbow Hole. Plenty of room for boats! Living Room on both floors. Coffee maker on both floors. Coffee, sugar, some common spices, charcoal, and lighter fluid on both floors. Fully furnished kitchens on both floors. Full kitchen on both floors. Unit 1 has dining table that seats 6-8. Unit 2 has a bar with 4 bar stools. Relax, eagle-watch, and fish to your heart's content! This house has plenty of beds for larger groups. Most of the bedrooms have a bathroom attached or very close to the room. The two decks and the fire pit are great places to spend time outside. It is right on the river allowing easy access to fishing. Perfect location. Clean and comfortable. Great location. Owner could not be more helpful. Second time staying at this property for a reason! Great location and plenty of space for getting together with friends and family. Cabin was just what we were looking for our group of eight guys on a fishing trip. Plenty of comfortable beds and bathrooms. Everything worked just as advertised. Kitchen well stocked for a fish fry. Wood for the firepit was an added bonus. We would do this again in a heartbeat. The property was well kept and was in very good condition. The views out onto the water were great. Was the perfect size for our fairly large group. Well-equipped house with all the amenities you and your party need for a great stay. The house is well-suited for a great stay. Walk-in access to the river for fishing, great views from the deck, well-equipped kitchen for large meals or just coffee, comfy beds, plenty of towels and clean! The house is in close proximity to downtown Cotter and Dally’s Fly Fishing store. We rented the house and had friends stay at the resort down the road in their Airstream...so many options for getting a group together to enjoy the tail waters!